Nitrogen regulators are necessary for working with the Beer Gas nitrogen blend that is used for serving nitro beers like Guinness. The nitrogen regulator has a male coupler to fit the female thread on the Beer Gas tank. 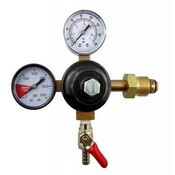 Nitrogen regulators are also rated to 3000 lbs of pressure so that they can work with the Beer Gas tank. DO NOT adapt a co2 regulator to work with a Beer Gas tank unless it has been rated to 3000 psi. This is a Dual Gauge regulator with a single 1/4” MFL threaded shut-off. Use with a Swivel Nut Hose Stem to adapt to tubing.